I do not collect test equipment; I Do Not collect test equipment. I do not collect test equipment! I just seem to be getting an awful lot of it, that's all. I've been out to get one ever since I found out they were being made. I'm familiar with the AVO name because I have one of their early photographic light meters. I'm going to be lazy and cut and paste what I already wrote there. 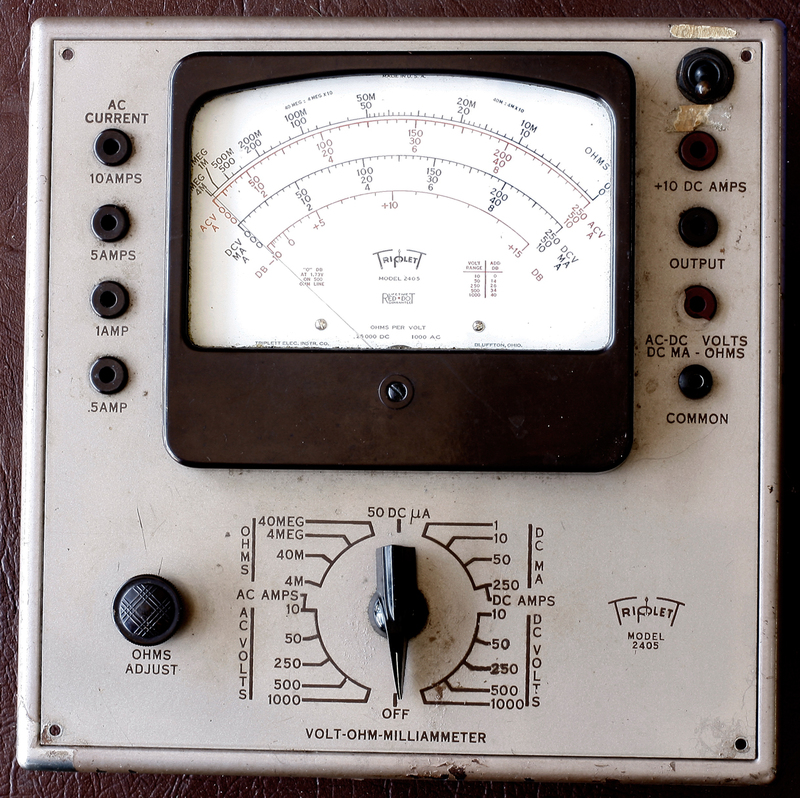 If you study electricity or electronics, among the first things you learn are three fundamental measurements: voltage, amperage and resistance (which is measured in Ohms). 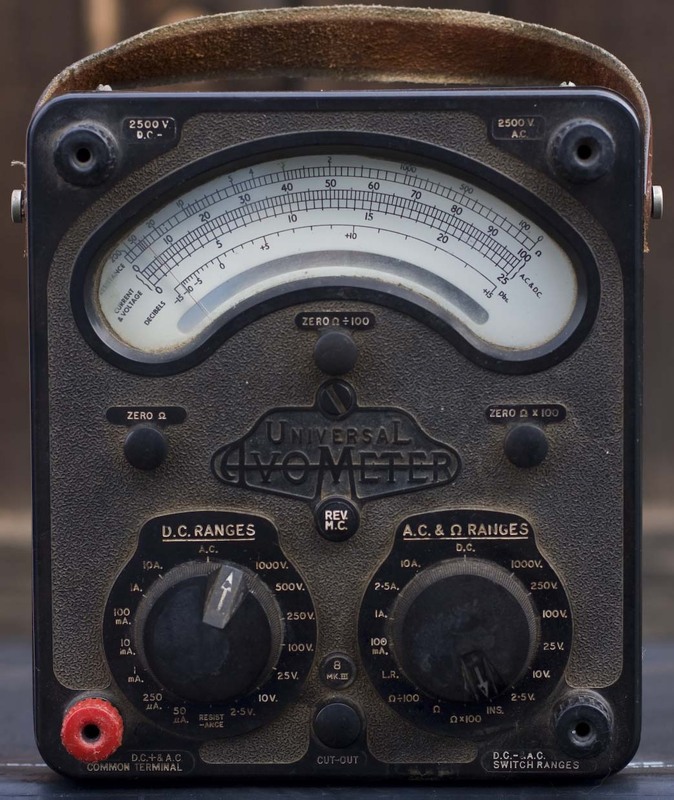 Early on, there was a separate meter to measure each: a voltmeter, an ammeter and an ohmmeter. In England, a Post Office engineer named Donald Macadie invented a meter which combined all three. He took his invention to ACWEECO, which stands for Automatic Coil Winder and Electrical Equipment Company. ACWEECO began as a wire-winding company, making coils for electrical applications. 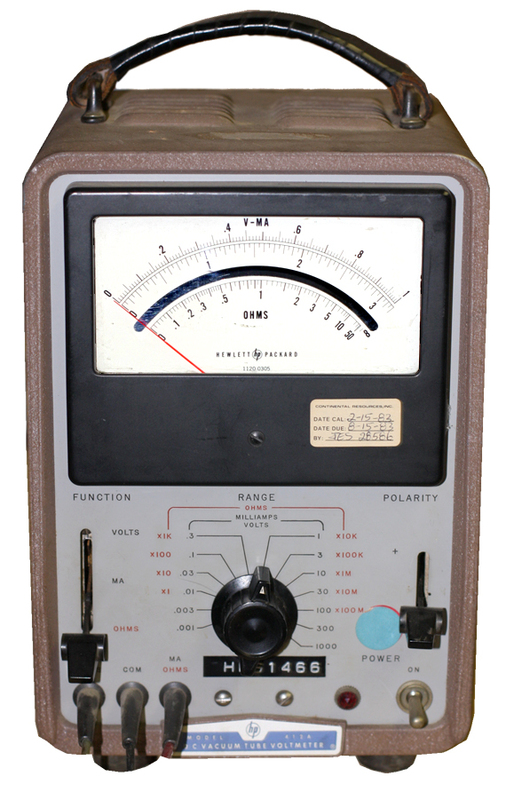 They manufactured and sold Macadie's machine as the AVO (Amp/Volt/Ohm) meter. This did so well that the AVO name became a brand in itself. These days AVO is owned by a company called Megger. So in American-english, it's a VOM. Peter Vis has an excellent write-up on this and other AVO meters. A forum thread discussing the different variants (marks) of Model 8s. Skip down to PMMunro's message (#8). I like this part the best: Some people believe the Model 8 Mk III and 9 Mk II to be the best Avometers ever made - they prefer these to the later Model 8, Mks V, VI and 7. According to another forum thread, the last four digits of the serial number tell you month/year of manufacture. I've got the William the Conquerer edition, 1066, so I assume that means it was made in October of 1966. I haven't tried it yet. It's pictured as it is in receiving-inspection (aka my workbench): dirty. That textured cabinet looks nice but holds dirt and grime. The meter moves freely, but no batteries and no battery cover (I'll have to see if I can get a replacement cover). The low ohms ranges use a standard D battery, but the high ohms calls for a 15V oddball. I saw a comment somewhere that it can be had for reasonable prices if you bother to search a bit, but I suspect that may be true in Europe but not in the USA. Since this is primarily going to sit on a shelf for my collection, not having the high-voltage battery isn't going to be much of a problem. Click on the PDF icon for the owner's manual. Current condition: needs cleaning. missing battery cover. no batteries. untested. Yes, I do have a few things made after I was born. This was a gift from my father for the intro-to-electronics class. They had lab equipment but it was nice to be able to do some of the labs on my own at home, and to do almost anything you need a meter. I already had two cheapies, a little analog that says IBM on it (which means IBM whores out its name for anything) and one of those digitals that Harbor Freight gives away if you present the coupon at the cash register. They're good for testing batteries and little things, but neither inspire confidence. It's like taking an introductory photography class with an old Kodak Tourist. This is a nice one; I remember digitals from the 80s and 90s and they were murderously slow; waiting for them to update was like waiting for a bus—it always seemed to take 30 seconds between updates, and God forbid you had a poor connection because the thing would never settle. This one's much nicer—the display updates much more rapidly. It's got a big display so I could read it even before I got bifocals; and it's got a rocking display so you can set it at a nice angle even when it's lying flat on the bench. It's got a couple of hooks on the rubberized cradle to hold the probes (though it doesn't do anything about the cables). Fluke has nothing to worry about, but it's a nice unit anyway. So I just had this thing open to replace the battery (it's the kind where you have to remove the whole damn back and expose everything, because it's cheaper than making a dedicated battery compartment), and I noticed on the PC board that it says MASTECH. They make about 100 different meters under their own name, so it's very possible this is a re-branded version of something of their own. Or maybe it's the same guts in a redesigned shell, but I don't know which. I didn't realize this until I was writing it up—this is the bigger brother to the cheapo Harbor Freight (also a Cen-Tech) that's rattling around in my car tool box. Dunno if it's also a Mastech. I guess I'll find out the next time I forget to turn it off and inadvertantly kill the battery. 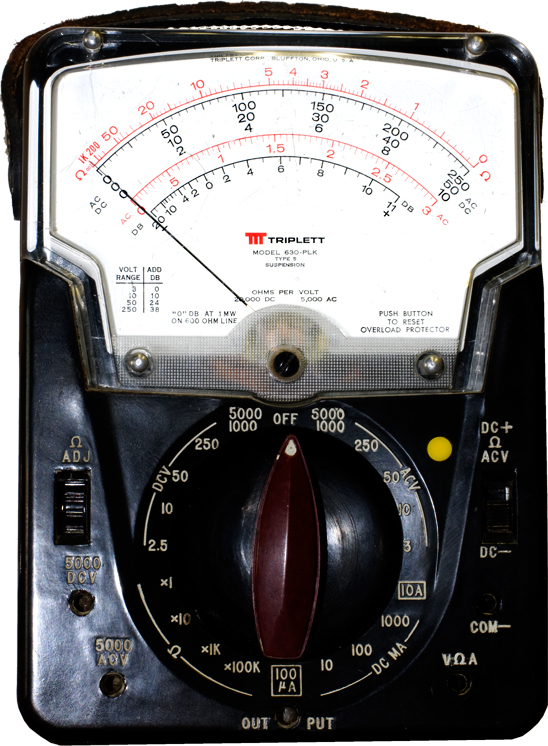 I was taking the electronics class and reading on various subjects, and for some reason I decided that the big void in my life was shaped like a VTVM (vacuum tube volt meter). So I started looking for one of my own. The great part is that there plenty; the bad part was trying to figure out which to buy. My father has an RCA Senior VoltOhmyst, and I was leaning toward buying one of those, though it seemed odd to have two of the same thing; why not get something else, figuring one might be strong where another is weak? Or something like that. 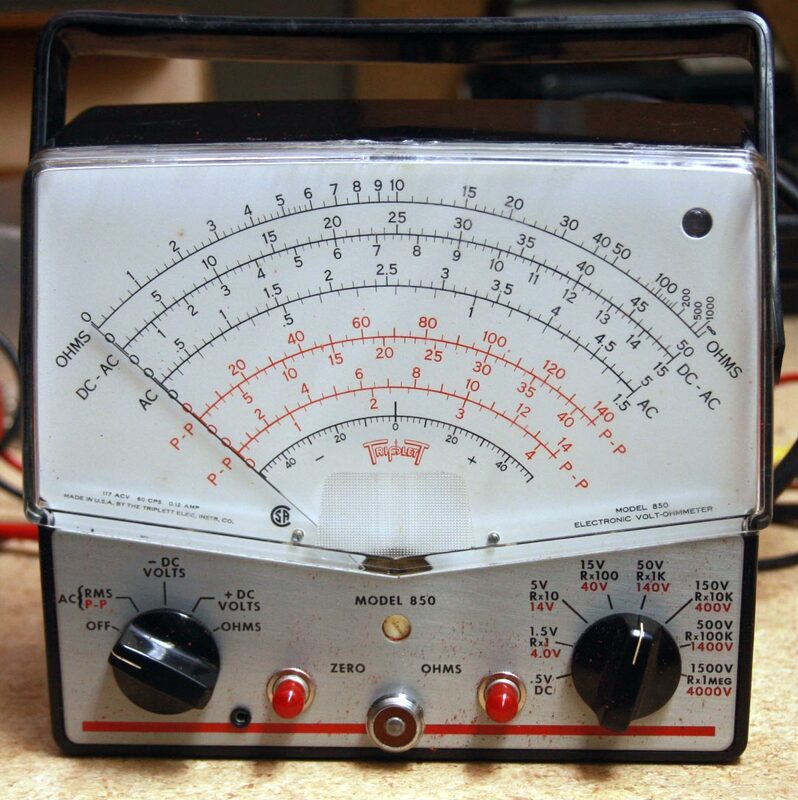 Then a funny coincidence occurred: I was on a website reading about the virtues of someone's Hewlett-Packard 410B, when a pair of HP meters showed up for sale; I bought them (cost me more in shipping than I paid for the meters). This guy came out in 1951 (he first appears in the Hewlett-Packard Journal in the November 1950 issue) and ran until 1975, if you believe Radiomuseum.com. Mine's an early-ish version with a relatively low serial number. The early ones have a flat front panel with curved edges like a lid, and the name/model are painted directly on it. At some point in the 1950s they restyled it to have a raised flange around the edge, and the name/model was on a badge at the bottom (my 412A below is styled the same way). DecadeCounter.com has a nice photo of it. One of the things I find most interesting about the 410B is the multiple, permanently attached probes. In my vast experience, every meter I'd ever seen had two probes: one black, one red. These have a bundle of four, which seems more like eight, and I have to tie them up with rubber bands. The 410B's black and red probes have little claws and nuts to pinch the probe needles, so you can remove and replace them if you need to (which works against me here—one of the nuts and needle was missing, I ended up using an old phonograph needle). It turns out that I really don't like having four probes. It would be great if you could plug/unplug them as you need them like any other meter. The nice part is that they don't get lost, but the result is a perpetual tangle. It seems like I can't even turn this thing on without the wires turning into spaghetti; and they usually manage to tangle with any other leads I've got on the bench. More on this on Teardown Tuesday. There's a restoration of this meter on Steve's Web Junkyard. He went a lot farther with it than I. Also: I found this website, Kiss Electronics, which sells parts and will repair/calibrate HP 410Bs. What really caught my eye is that they sell a leather handle replacement kit for a reasonable price ($11). I've been using one donated from a thrift-shop purse and it's a bit too big and ridiculous looking. Click on the PDF icon for the owner's manual. Link goes to BAMA. +-3% full scale on all ranges. I bought this one with its older brother, the 410B above. This one was introduced in the summer of 1959; I don't know how long it was in production. This is the next-generation VTVM. According to the HP Journal (July-Aug 1959), it was designed for low-level DC voltage and currents that were becoming common thanks to solid-state electronics. I wanted to like this one—it only has three probes and they don't tangle so much, and the AC probe is lighter and doesn't knock into everything the way the 410B's does. But it was squirrely and odd from Day 1 and beyond checking its tubes, I never made a serious attempt to troubleshoot it. If I can get the 410B running again, I may try this again. Also unlike the 410B, I have a hardcopy of the manual that I found at a local used bookstore. I never scanned it because my copy is identical to the one on BAMA, except that mine doesn't have the errata page at the end. Found at an electronics surplus shop that I call Computer Graveyard, and got him for $15. It appears to work properly and accurately, so I don't have any photos of its innards yet. Some day on Teardown Tuesday I'll take the case off and photograph it. This is the solid-state version of a VTVM. I love vacuum tubes but I'm not going to say they're better for everything; this guy doesn't need much time to warm up and stabliize, at least in theory. I did find I had to wait a bit for it to settle down properly when I was on the highest ohms scales. Using it takes a little practice. The Old Man works curses it because the ranging is unfamiliar; since I don't have 50 years of experience to unlearn, I have to take the time to read the panel anyway so I don't struggle as much. The nicest thing about it is that it has a big, easy to read display; equivalent to the Triplett 850 and the RCA Senior Volt-ohmysts. Current condition: okay on ohms; doesn't zero on AC volts. Needs testing on other modes and ranges. 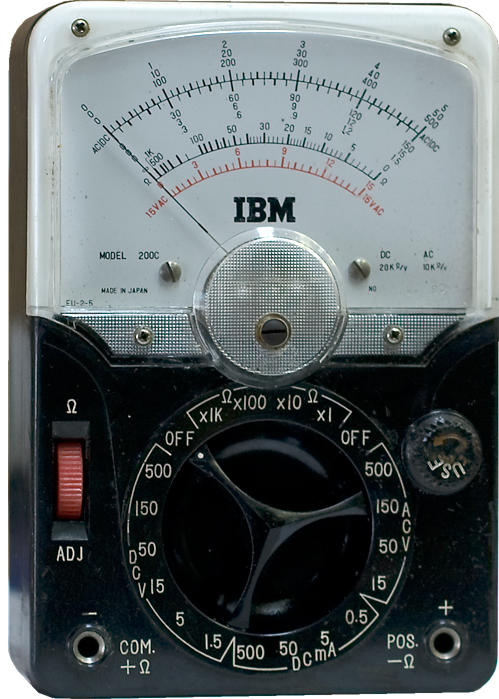 As far as I know IBM didn't make their own meters; they bought them and badged them for whatever reason. I had heard that they badged one of the mini Tripletts, and I think they did the same with an AVO, but not this time. This is a Japanese-made no-name. It's cute but not impressive. I'm not sure what the point of branding it IBM was; did they really need the money they earned in licensing their name to stuff like this? I find that hard to believe. Whomever made it branded it for various names. This appears (with some minor changes) in the 1974 Oson catalog under their own name. A gift from The Old Man because my two HP VTVMs were wonky. He got a good deal on it via eBay, sanity-checked it inside and now I've got a nice unit. I believe he changed the test lead input as well. 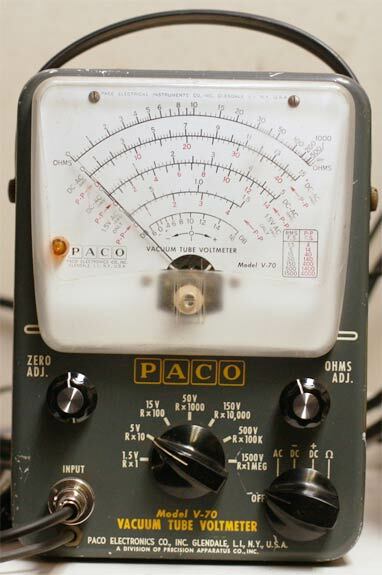 PACO is another name for Precision Apparatus, which had its heyday in the 1950s in hobby magazines as a mail-order equipment company (along with Superior). I believe this is the same company that was merged with B&K to become B+K Precision; in which case they're still in business. This is about the size of a Simpson 260. Simple to operate. The scale is bright and clean and easy to read. It's relatively light so I have to be a bit careful not to accidentally pull it off the shelf where it lives above my benchtop. It bears a strong resemblance to a couple of other meters, including a Heathkit something-or-other; but I haven't investigated to see how close they are. Steve Johnson wrote a niece piece on Simpson equipment in general, and this one in particular. This was brand new in 1948 (there's an ad for it in the November 1948 edition of Radio-Electronics magazine), but they made it for years so it's hard to guess how old my particular machine is. Johnson also has a color advertising pamphlet for it. Essentially it's a 260 (below) in a portable carrying case, but it has an unusual gimmick: instead of having a standard meter face with multiple scales, it has a scrolling face with a mask so that only one scale is seen at a time. The scale is selected at the same time the function/range switch is set, so you don't have to spend a minute staring at the meter trying to figure out which scale you're on. Mine was physically pretty but not working when it arrived, so I opened it up. You can see the innards on Teardown Tuesday. Click on the PDF icon for the owner's manual. Link goes to Simpson260.com. Kind of like the B+K scope, it was a "take it and don't bring it back" deal, though really I think he was taking pity on me because I had two analog meters and they were both dogs: one was an ultra-cheapy, the kind you get for $2 at Harbor Freight, and the other was the HP 410B above. This doesn't have the full advantages of a vacuum-tube model, and ammeter feature doesn't work (hence the masking tape note). But it works fine as a DC volt/ohm meter, and for some things that's exactly what you need. On the other hand, my Old Man still has at least a half-dozen meters of various kinds and quality salted away, so one fewer won't make much of a difference. This is the Series 6 version. If you want to know almost everything there is to know about this thing, check out Simpson260.com, a website devoted to this one VOM. It's amazing. Here's the wearisome story of how I ended up with this thing (you've been warned). I was watching the great EEVBlog and there was an episode where Dave pulled apart three analog VOMs: a Metrawatt Unigor, a Simpson 260 and a Triplett 630. I know Metrawatt because I'm familiar with their photographic light meters and I have a Simpson 260 (above). I knew of Triplett but had never seen any of their stuff. Dave pulled open the Metrawatt and didn't think much of it. He opened up the Simpson and was rather complimentary. Then he pulled open the Triplett and just raved about it. 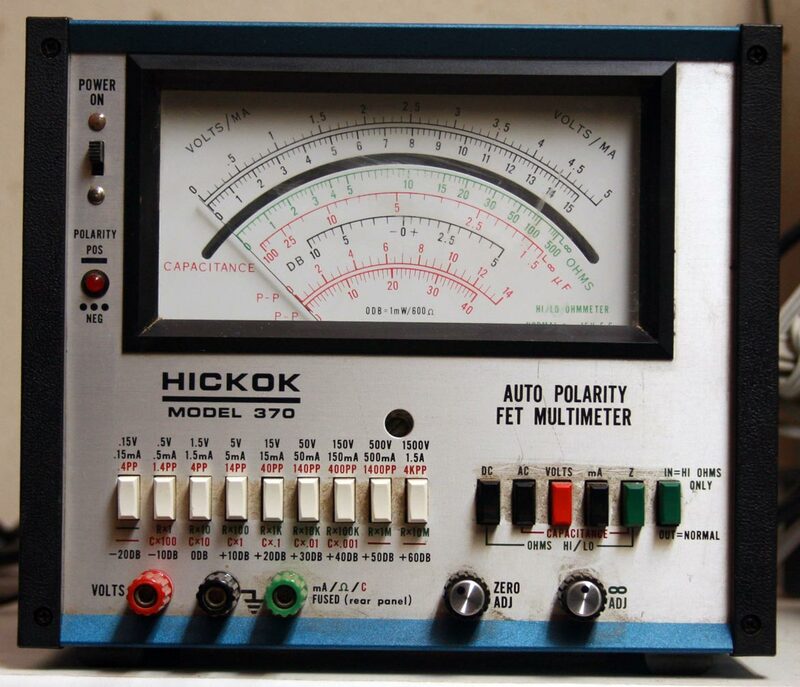 I don't collect multimeters, but if I find an interesting one at a reasonable price I'll buy it. So I looked up the Triplett 630. You can still buy them brand-new for about $300 (since 2007 Triplett has been owned by Jewell, so nobody knows whether the new 630s are the same as the old ones or not). A search for used 630s turned up a horrendous number. 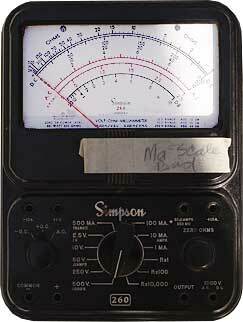 Like the Simpson 260, they made them for decades and offered all sorts of variants. Which one would I want to buy, if I could find one for a good price? 630 - original version with "curved top" introduced fall 1947. 630 - from Sept 1952 through 2007, has the classic interior configuration. 1.5% resistors and 2.5% movement. 630-A - late 1953, has mirrored scale, 1% resistors and movement. 630-D - a 630 made specially for Bell Labs. 630-L - first version with big clear lucite wndow and red knob. L is for "low power ohms scale" that wouldn't trigger forward-biasing Germanium diodes. 630-PL - standard 50µA movement, 20KΩ/volt DC, 5K Ω/volt AC. 630-PLK - PL with overcurrent circuit protection (probably the one I should get). 630-APLK - PLK with more precise movement resistors and scale mirror—post 1976 the PL gets all these features. 630-NA - PL but with voltage range doubler switch. 630-NS - NA but 5µA movement for 200KΩ/volt DC (be careful because many of these have gone wonky over time). 630-M - a rare model. Different circuit board. 1µA movement so 500KΩ/volt DC (higher range), 1MΩ/volt DC (lower range), 10K and 20KΩ/volt AC. Only needs one D-cell battery! (A common complaint with other 630 models is that they took a second, oddball 30V NEDA 210 battery that's pricey and hard to find). Armed with this, I began surfing the web for 630s for sale, and ended up on eBay—where someone had a 630-M for sale at Buy It Now/Make Offer, and the Buy It Now price wasn't insane. (If you buy much on eBay, you know what I mean.) So I made the guy an offer I thought was reasonable—he took it, and now I have a 630-M.
Of course, mine was pretty beat, so it had to be opened up. You can see more of it on Teardown Tuesday. Click on the PDF icon for the owner's manual. Link goes to Steve's Liberated Manuals and Books. 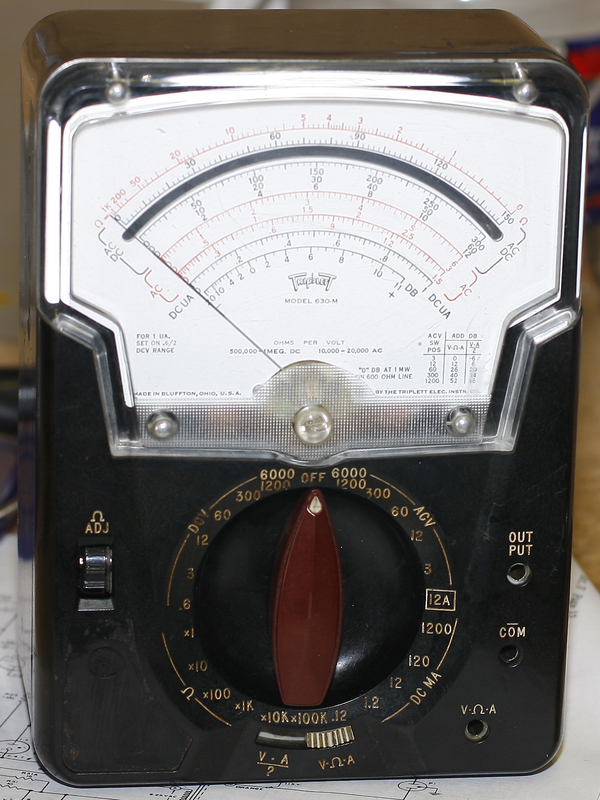 One of the The Old Man's meters, which he gave me as he downsizes his workbench (he still has an RCA VoltOhmyst for the good stuff and a couple of inexpensive DMMs for knock-about work, and probably has a couple more he's salted away and forgottten about). There's not a whole lot I can say about this one that I haven't said above regarding the 630-M. According to Fred Scoles, the PLK version is a PL with overcurrent protection: "the added overcurrent protection circuit which comprises switching transistor sensing ckt that could trigger a big-ole relay off if you tried zapping it with something the meter didn't like. These Protection ckts worked as long as you don't get them near a high-tension power line or near high field RF's which will 'fool' the sensing ckt every time." 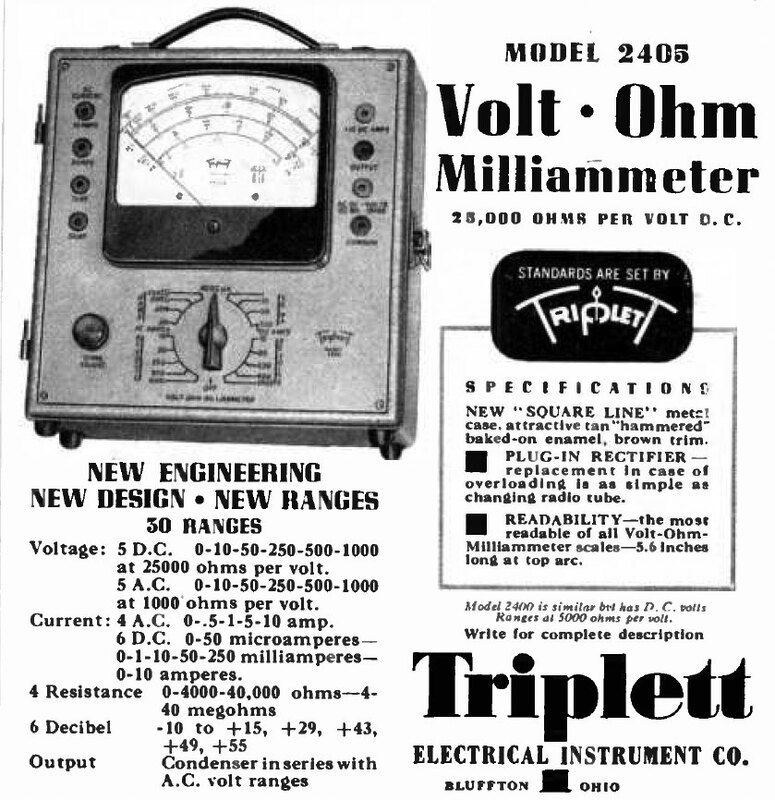 The PL was the basic 20Ω/volt DC, 5K Ω/volt AC model. I'm not sure of the vintage; this one has the big red TTT logo on the meter face, and I don't know when they introduced that. My 630-M (above) has the old arcing TripleTT logo. Mine is a Type 5 movement; Allied's 1969 catalog shows this model with the Type-3 movement, their 1980 catalog (the most recent that I have access to) is the Type-4. So I'll say this is mid- to late-1980s. Click on the PDF icon for the owner's manual. Link goes to Triplett.com. A beautiful machine. A gift from the Old Man, who got it off eBay and went over it. This one is the same size as his RCA Senior VoltOhmyst, which means it's got a great big, easy-to-read meter face. This one came in a padded transportable case and included the original owner's manual. Fred Scoles, on Antique Radio Forum, says that's almost identical to the RCA, except that the latter has an adjustable cap for higher frequencies. He also says that both of them have the same problem: they both use 5% carbon resistors in the Ohmmeter multipliers. Better VOMs (like most Triplett 630s) used 1%. I was all set to use this as my bench meter, but the meter decides it sticks. I opened it up and with some artful tapping and persuasion, it seemed to be free and working well—until I put it back in the case and it promptly froze again. I'm going to have to do a real disassembly: probably by pulling the front panel off, to see if I can clear whatever debris got into the meter movement. From 1946. I know this because the ad below came from the December 1945 issue of Radio magazine. 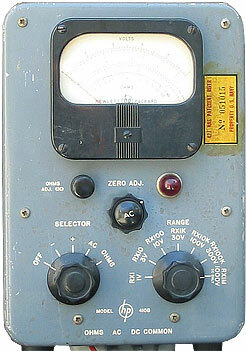 This is the upper-tier version; they also made a Model 2400 that's the same except it's 5,000 Ω/volt on the DCV scales. That makes it one of the rare examples where there are two versions of something and I have the better one. Like the Simpson 221 above, this one has cabinet with a protective, removable hinged cover, except that this one is all-metal instead of fabric-covered wood. Not as pretty but it'll take a beating. Nice big meter face so you don't have to squint to read it. Looks like a VTVM because of its physical size (it's 10-in. tall by 10-in. wide by 6-in. deep), but there is no amplifier. The unit runs on two batteries, a standard 1.5V "D" cell (the one that arrived had the worst case of acid-leakage I've seen. It had literally burst the side seam) and a big 22.5V Everready 715. The latter is no longer made; I figure I can get two 8-AA battery holders, rig them in series and put that in, as 15 AAs would provide the right power. Or I suppose I could run a wire out of it and run it off a variable DC supply. If you want to see inside it, it's on Teardown Tuesday. Picked this one up on fleabay because I neglected my due-dilligance; I thought it was something similar to my Hickok 156 Trace-o-Meter (a signal tracer), but really it's just a VOM (a nice one for the era, but still, it's just a VOM). I don't collect multi-meters but if I did, I'd want a Weston in the collection. 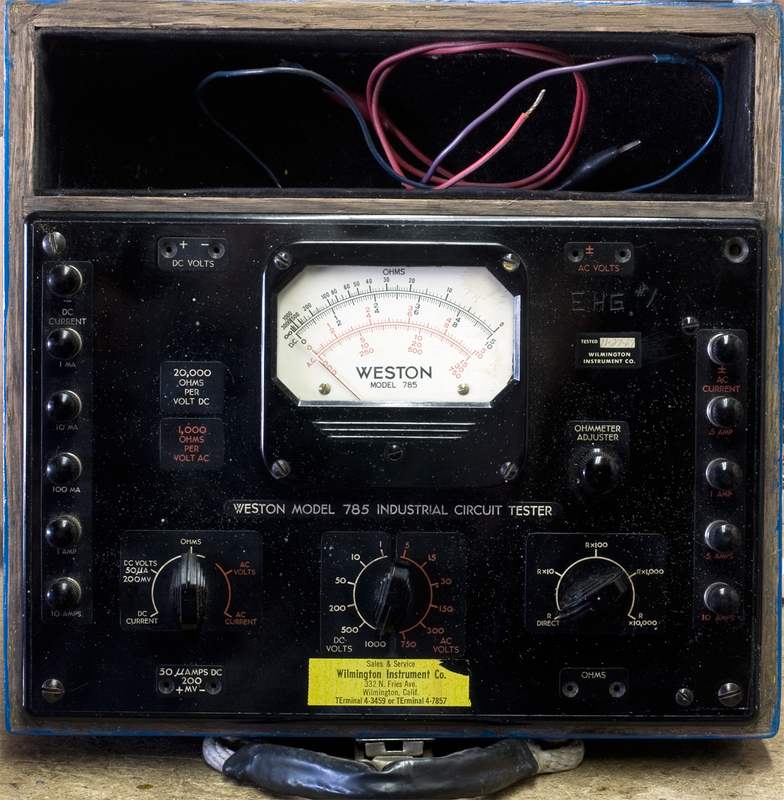 Most people probably remember Weston for their photographic light meters, but they made electrical test equipment as well, including multi-meters and tube testers. This one is from 1942, as determined by the earliest advertisement I could find (Radio Craft magazine), and backed up by the date on the instruction page fitted inside the lid. This is a Type 4. Types 3 and 4 are identical except that the Type 3 has a metal shell and slips into the oak cabinet, so you can take it out and use it if you think the wood will get messed up; the Type 4 fits directly into the oak cabinet and that's it. My initial reaction to it has been a mixed bag. I was shocked to find when I opened it, that the D-battery hadn't yet leaked and begun corroding anything around it. That may be a first. On the other hand, the wood cabinet has been painted royal blue. It's a nice blue but I rather like real wood, so I may end up stripping the paint and refinishing it. If the cabinet looks awful after that I'll paint it, but a proper test-equipment black. It's also missing the handle, which puts it in the company of both my HPs above, my Sylvania tube tester, and probably a couple of other things I've forgotten about. Some day I'm going to order a bunch of handles for these things. Another good part is that the instruction sheet in the lid is largely intact (the edges are eroded away but not enough to make it unreadable); I've seen requests for people who want this, so I scanned it (click the PDF icon). You can also download a copy of the Weston Model 772 analyzer, which is very similar, from KevinChant.com. It's not quite the same thing, but it's close enough that it may be useful, and it's got a lot interesting extra information. In the meantime it's being used to hold the veneer down while the glues dries on my Silvertone Midget.